A weblog about the band Rush, Geddy Lee, Neil Peart, Alex Lifeson, the Time Machine Tour, and Clockwork Angels. Good interview over at the Globe and Mail with Geddy and Alex. Nice photo too. When asked about Rush's late-career mainstream acceptance, Lee suggests it likely took root years ago. "Some of our fans have been profoundly affected by what we do," says the soft-spoken singer. "You hear about people who have been comforted by our music. And maybe, after a period of time, that fan base is growing up and coming to grips with their own experiences, and wanting to write books about them, and saying thank-you in movies." Check out the slide show too. This page contains a single entry by jim published on June 9, 2010 8:19 AM. Geddy & Alex interviewed on CBC's The Hour was the previous entry in this blog. 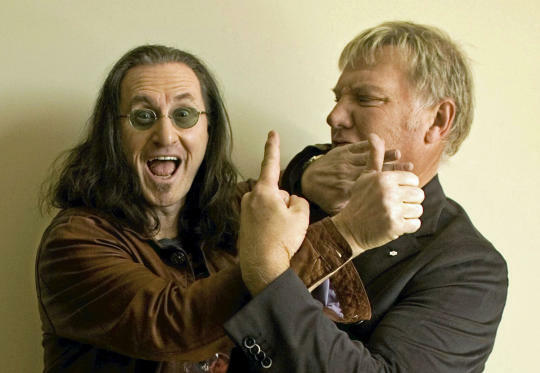 Rush Interview at Rolling Stone is the next entry in this blog. Find recent posts on the main index or look in the archives to find all content.